It’s time for a short Friday Five installment. I figured I would do a list of five baby things that I’m loving right now. Baby Z-peat is 8 months old already! The months are really flying by. He is at the stage now where he want to grab EV-REE-THING and put it in his mouth. He doesn’t have any teeth yet, but he’s drooling like crazy. I’m guessing he start pushing some teeth through pretty soon. Ok, let’s get to it. 1. Vulli 2 pack vanilla flavored ring teethers – Ok, every parent knows about Sophie the giraffe by Vulli. We love, love, love Sophie. Our Sophie is now on her second child and she is still going strong. I found these ring teethers when Little Z was still Baby Z. He loved them and that’s holding true for Baby Z-peat. They’re small enough and easy to hold and maneuver for little hands. The animals on top allow him to get the teether back far enough in his mouth to soothe both his front and back gums. Plus, the bright, whimsical colors and animals are just too cute. 2. Bright Starts Lots of Links – You can never, NEVER have enough links. We have these things on everything: highchair, stroller, jump-up, bouncy seat. They are a lifesaver. Baby throws toy down, Mommy simply pulls rings and toy comes back up. No constant bending over to pick toys up. Plus, baby can pull the toy back up himself by the rings. He also likes the sound they make when he bangs them against…everything. 3. 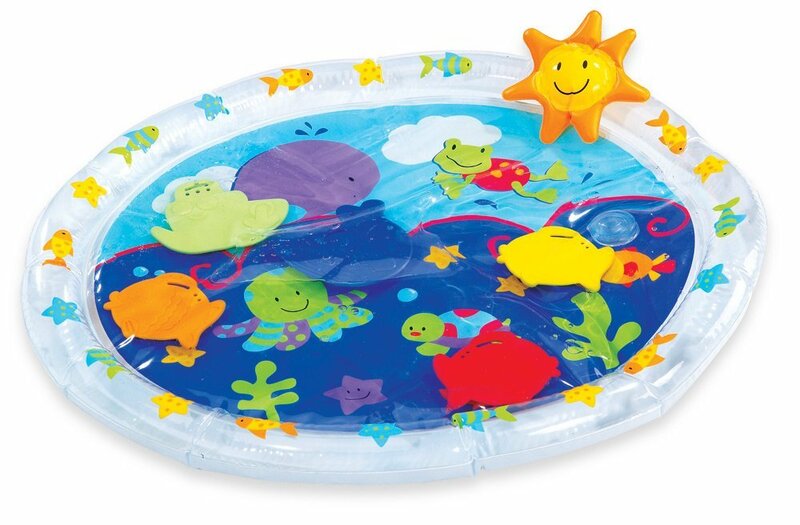 Earlyears Fill ‘N Fun Water Play Mat – Baby Z-peat is having a lot of fun patting and squishing this play mat, especially now that he’s sitting up really well. This pay mat will entertain him for quite a while. An added plus is it’s really cooling for those hot summer months. 4. Baby Einstein Sea Dreams Soother – This thing has been a lifesaver with getting Baby Z-peat to sleep in his crib. It latches snuggly onto the end of his crib and you just press the starfish for it to play soothing music or white noise, with or without the aquarium lights. And the cute fish and crabs move around. He’s getting to where he can press the button himself and I’ve come into his room several times to find he’s wriggled his way up to the aquarium and pushed the button to watch the fish move around. It also has a nifty remote so you can re-activate it from several feet away without waking the baby. 5. Tomy Lamaze Soft Chime Garden Musical Toy – We got this for Baby Z-peat for Christmas and let me tell you it has been a hit with the entire house. The threenager, Mr. Z and I have all been caught playing with this thing at various times. It is so cute and stimulating. It has three modes where the flowers will play a single chime, part of a song, or an entire song when you softly tap or bump them. The flowers also light up when you tap them. It has velcro tabs on the bottom so you can strap it to a stroller or car seat bar. It really is such a cute toy and very engaging and entertaining for babies and big kids alike.